Home to kings and queens since William the Conqueror, Windsor is dominated by its castle, which, as benefiting a monarch, is the largest in the kingdom. The trail starting in Egham takes you first to the calming waters of the Thames, where you can explore Runnymede, the site at which medieval barons forced a King John to sign the Magna Carta in 1215 which lasted less than three months. Read more about the situation surrounding the Magna Carta. From there you will walk into the Great Park. Dating back more than 900 years, this former royal hunting ground is an area of scenic woods, beautiful lakes, and pleasant pastures. The Great Park covers 4,800 acres, parts of which are open to the public with well maintained paths for all ages to enjoy. Its present area was determined in the 1360s and was popular with Saxon kings as a hunting forest. The park is shrouded in mystery and legend and for over 1,000 years the story of Herne the Hunter has been told. It is said that his ghost still appears wearing the antlers of a stag, riding a phantom black stallion at the head of a pack of black hounds. He appears to warn of times of trouble and gallops through Windsor Great Park only to disappear into thin air. Thankfully I didn't see him on my walk through the Great Park. It's free entry to all areas of Windsor Great Park, except for the Savill Garden. The Savill Gardens visitor centre make for a lovely lunch stop with adequate toilets and baby changing facilities. There is a decent selection of food for lunch including sandwiches, pastries, hot freshly prepared food and cakes, even gluten free ones. Walk to the obelisk and round the tranquil lake and past the Guards polo club. Teams from all over the country, and abroad, even as far as Argentina, compete with their entourage of ponies. Polo ponies are renowned for their agility, and makes for a game of great speed and excitement. The Queen was often to be seen watching, as was Princess Diana in more recent years. Both Prince Charles and The Duke of Edinburgh were skilled players in their day. Prince William and Prince Harry are also accomplished players today. Shortly after you will see a very fine Statue of Prince Albert, The Prince Consort, placed there as the Jubilee Offering of the Women of England to Queen Victoria. Continue walking through the vast grounds to the The Copper Horse, a statue of George III on horseback. It was erected on Snow Hill by his son, George IV and created by Sir Richard Westmacott in the years 1824-1830. The statue surprisingly has no stirrups. 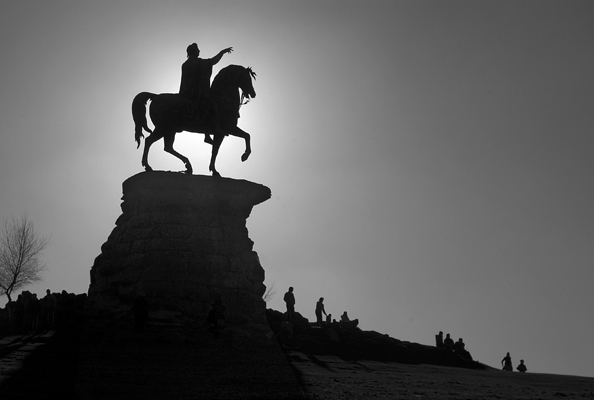 George IV wanted the statue of his father to resemble that of Peter the Great in St Petersburgh, hence the massive base. Before the Copper Horse could be erected, it was damaged in transit when the cart carrying it broke down near Snow Hill, and a furnace was set up on the spot and repairs made to the damaged leg. It is said that Henry VIII stood on Snow Hill awaiting news of Anne Boleyn's execution which was to be signalled by gunfire from The Round Tower. There are superb views of the Castle from The Copper Horse along The Long Walk, another avenue similar to Queen Anne's Ride, some two miles long. Well worth a - long - walk! The 'Long Walk' was once described by Jonathan Swift as 'the finest avenue I ever saw'. Lined with oak trees and grazing deer, it will offer a spectacular ending to your hike as you approach Windsor Castle for one of the most photographed and recognisable views in the country.